Do you struggle with E meals on the Trim Healthy Mama plan? I feel your pain! So let’s join forces and learn to conquer our carb fears in 2018! Join me, and other THMs, in the E-a-Day One Week Challenge starting January 1! Do You Wrestle With This Internal Dialogue? I’m a low carb diet “refugee.” I followed the Atkins diet over 10 years ago and still struggle with that voice inside that keeps me afraid of the carbs. After over TEN years, people. Plus, I love me some buttah. And cheese. For real. Nothing wrong with buttah and cheese, but when you’re following the Trim Healthy Mama plan you need to be sensible about HOW you eat them. That means with low carb options. And when you’re eating the carbs, you keep the fat low. Sometimes it’s a tough concept to grasp, I get that. But it’s not impossible and carbs are nothing to fear. Carbs Are Healthy (Just Make Sure You Eat Healthy Carbs – Properly)! The Trim Healthy Mama plan book explains how carbs are actually nourishing to our thyroid and adrenals. Those two guys shoulder a lot of the blame for slow or no weight loss. So we need to get over that fear, Mamas. We need to learn the whys and hows of eating them. We need to practice planning for them too! That’s just what we’ll be doing starting January 1, 2018 (with a little prep on December 31 😉 ). 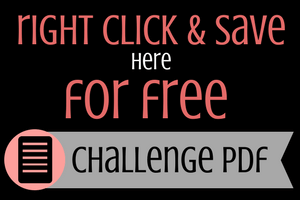 Download Your Free Copy of the An E-A-Day Challenge! An encouraging welcome letter (plus some “legalities”). Challenge Overview page – know what’s expected each day so you can plan ahead. Menu Planner page – we’re going to practice planning our E meals! Shopping List – with categories to help you plan any needed purchases. Measurements tracking page – not required, but for those who want to track weight and inches it’s a handy place to record them. Notes – a lined sheet you can print as many copies of as you need for taking notes, writing down recipes you want to try, or other inspirations. **You’ll probably want to have your print quality set to “best” – I’m not sure why it doesn’t print as clear otherwise. It may just be my printer but just in case, I’d hate to have you waste ink! 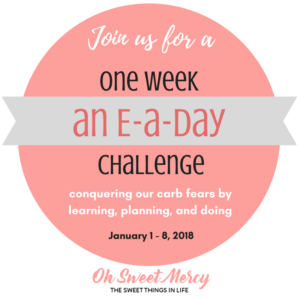 What Do You Need For This E-a-Day One Week Challenge? A copy of the THM Plan book. I’ll be referencing from the new plan book BUT if all you have is the original book, I have that as well and can help you navigate the information there. A printed copy of my An E-a-Day One Week Challenge packet (right click on the link and select “save”). Look through the pages and print what is relevant to you. Highlighters, post-its, page flags, etc. – anything that you find helpful for marking important information for future reference. A positive attitude and willingness to change what hasn’t been working anyway. A willingness to try new things! How About Some Tasty E Recipes To Consider? Join Me on Facebook Live for Daily Check-ins! Live video makes me a little nervous, but I’m going to step outside my comfort zone just for you (see number 5 above…). I’ll be posting FB Live videos daily to show you what I’m eating and share some tips and recipes. Join in the fun and share photos of your own E meals and snacks, ask questions, and encourage others! So to see what I’m eating (and whether or not my kitchen stays clean) head on over to the Oh Sweet Mercy Facebook page. Be sure to click on the “following” tab and make sure you’re following and have notifications set to “on” if you’d like to receive updates. I haven’t decided if I’m going to do the updates at the same time each day or when it’s time to have that day’s E meal or snack. What do you think I should do? Leave a comment below and let me know your thoughts. Are You Ready To Rock Those E Meals? I have been working on this for the past few weeks. Let me tell you, if I can eat an E meal or snack every day for a week, anyone can! I’ll also share my one secret for satisfying E meals plus my favorite. It was a total surprise when I figured out what works for me. Get a copy of the THM Plan Book if you don’t already have one. Your local library may even have it or you can also get the Kindle edition very reasonably priced. The page numbers referenced in the PDF may not match the electronic version, though. Gather your note-taking and making supplies. 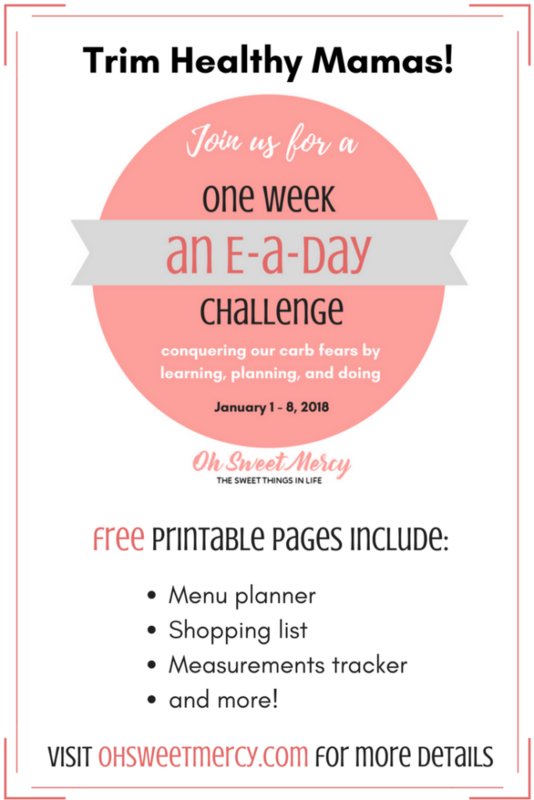 Print out the An E-a-Day One Week Challenge PDF (or just the pages you want to print). Check your pantry and be sure you have E-friendly options available and ready. Make sure you’re getting notifications from the Oh Sweet Mercy Facebook Page. I’m not sending out emails yet (still need to figure that out, I must confess…). That’s all you need to do! I hope you’ll be joining me January 1, 2018 as we conquer our carb fears once and for all. This will set us up for a successful, on-plan 2018! Share With A THM Friend! Pin to Your Favorite Pinterest Boards! No idea you had a Blog! Very cool! I really like e-meals but I think I will join you on this challenge as I really need to be more intentional in my planning. I have just felt like I I am more in survival mode through the holidays with lot of baking and sampling of treats. They were on plan but maybe not the most balanced diet! Some of my favorite easy snacks and breakfasts are granola & fruit and yogurt, the buckweat porridge, oats to go cups, roasted chickpeas, low-fat hummus and veggie sticks, sourdough products like English muffins or bread and peanut butter junkie for a PB&J, fruit and cottage cheese, etc. For E meals right now we are doing a lot of beans and soups and chili since it is really cold here right now! Hi Genet! Yep, I have a blog! I think I started blogging back in 2007 or something (long before I found THM). Combining my love for food, photography, and writing is such a blessing. And helping others in the process – I love my job! I’m glad you’ll be joining the challenge! Your E expertise will be helpful 😉 Very cold here too, I love beans but the family isn’t so crazy about them. Your favorite E things sound delicious! Thanks for stopping by, looking forward rocking these Es with you in just a few days! OHH this is GREAT!!! I’ll be hopping on board with you in this Challenge and sharing with the Mama’s in my Unofficial THM Book Study !! Love your printables!! Thanks Judy! So glad to have you along and hope this is helpful to those in the book study!! I’m looking forward to doing better in 2018! Hi Donna! I’m sorry I didn’t see this sooner, I hope you’ve been able to follow along ok! Don’t be afraid to ask in the comments to remind me! I’m such a scatterbrain sometimes LOL. Please feel free to contact me at any time, I’m always happy to help. You can use the “contact me” link at the top of my blog page on the menu bar (best way to contact me) or message on Facebook. Facebook doesn’t always let me know I have messages in a timely manner though so the Contact Me form is the best way to get a hold of me if you need a quick answer! Been following you on Facebook the last two days. Today I was able to print the PDF and read about the challenge. I am not afraid of E meals, I just want to add more to my diet. I am hoping it will help my turtle losing. Thanks for encouraging us in the new year! I’m so glad to hear you’ve been following along and have decided to join in the challenge! And glad to hear you don’t fear the E meals too. They can be tricky for those of us who like the S meals but they are totally doable! I hope this challenge helps you get more E meals and snacks in your days. I’d love to hear if it helps your turtle losing too, please come back and let us know! It’s truly my pleasure to help and encourage you this year, thanks so much for stopping by! 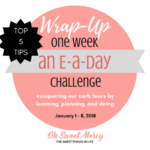 Thank you so much for doing this E-Meal-a Day Challenge! I was able to stick with it the whole week and loved the recipes I tried–like your Chocolate Java Instant Pot Oatmeal. I knew that Pearl & Serene said E Meals were important, but I very rarely fixed E meals because I was more comfortable fixing S meals. That probably explains why my weight loss had stalled. I had gotten stuck in a fuel rut. I am thrilled to say the numbers on the scale are going down again and I FEEL like a “Rock Star”!!! I have a new love for E meals and I’m confident that I can get at least 5 E Meals in each week. Thanks so much Sherry! I’m SO excited to see that you saw some progress this week and are more comfortable getting Es into your day. Exactly what I hoped would happen! Thanks for sharing, I hope you keep with it and come back in a while and let us know how it’s going! And yay for feeling like a rock star, huh? It’s great to feel confident! So glad you liked my recipe too, thanks!